"A yummy breakfast that is healthy but doesn't leave you feeling deprived, this no-cook oatmeal will be creamy by the morning time and makes breakfast prep time non-existent. Put all ingredients in a 12-ounce mason jar and vigorously shake to make preparation a breeze!" 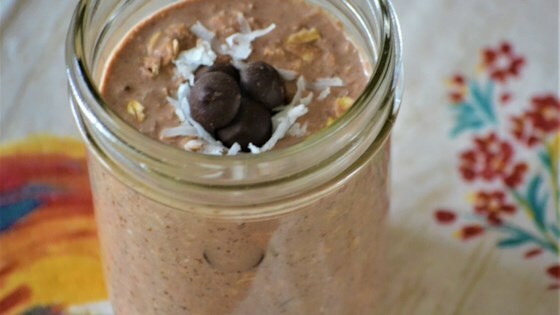 Mix almond milk, oats, chia seeds, coconut, maple syrup, cocoa powder, and vanilla extract in a 12-ounce mason jar. Cover and refrigerate, 8 hours to overnight. Stir and serve cold. Cashew milk can be used in place of the almond milk, if desired. Have made several variations of this recipe...with berries, peanut butter, chocolate, cocoa, peaches, chia seeds, pecans... every combo was different but excellent! My new fave breakfast. This was a good recipe... I didn't have chocolate almond milk but it was plenty chocolate-y for me. I added Greek yogurt for extra protein and creaminess. I took other reviewers' suggestions and used vanilla almond milk instead of the chocolate variety. The cocoa powder makes it plenty chocolatey! Delicious.I love overnight oats for breakfast.